In addition to its shiny new Kaveri APUs, AMD had plenty in store on the mobile gaming front. During a CES 2014 press conference, AMD revealed more information on its new mobile APU in the works, codenamed Mullins, designed for tablets and fan-less form factor designs. The chip maker claims that Mullins offers "more than two times the performance per watt of the previous generation mobile chip." (That's Temash, for those keeping score.) To show off just that AMD brought its internally-developed, 11-inch gaming tablet along with a controller cradle with a Mullins APU inside. Upon showing the device, known simply as the Project Discovery Tablet, company SVP Lisa Su immediately warned that this device will not see a commercial release. This Mullins-equipped slate is merely to show manufacturing partners what will be possible with AMD's latest mobile chip when it lands in the second half of this year. As soon as I got my hands on one of these Mullins tablets, I couldn't help but ask an AMD representative whether the company was considering creating hardware in the future despite Lisa's disclaimer. I asked out of hope, because for a purely concept device, the Project Discovery Tablet has the look and feel of a retail-ready product. Running full 64-bit Windows 8 and housed in a brushed magnesium shell, the Mullins tablet is a sight to behold, but not so much to hold. Despite being extremely thin and light for its size, this tablet didn't lend itself for one-handed use. The idea here is for the slate to remain in the controller cradle for as long as possible. Using the cradle controller revealed the Project Discovery Tablet's concept roots, with its joysticks proving to be a little too far from the face buttons on either side. Plus, the shoulder triggers were too far below and behind the large, soft bumper buttons. Regardless, playing Pro Evolution Soccer 2013 displayed snappy, responsive controls. Part of this is thanks to AMD's DockPort technology, which allows its APUs to use DisplayPort inputs for all sorts of data transfer, including physical input, audio and even power. Admittedly, this is a design that has been done before by the likes of Razer and others. At any rate, it's clear that AMD spent a considerable amount of research and development funds to craft a concept machine to inspire OEMs. As a result, AMD showed off some serious hardware chops. 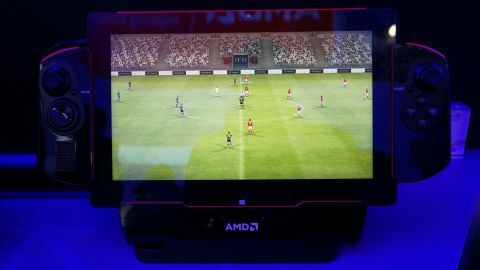 More importantly, the Mullins APU – which an AMD representative declined to reveal any specs on – showed some impressive game performance. While I can't speak to clock speed or cores inside the Mullins SoC that I tested, we do know that Mullins is built on a 28-nanometer architecture using Radeon graphics. During my time with Pro Evolution Soccer 2013, I witnessed zero frame rate dips or stuttering. I imagine, given that PES 2013 isn't a terribly demanding game, that it was running on either medium or high settings, which speaks to Mullins' power. Frankly, it was exciting to see a PC-grade game running on a mobile SoC with no issue. Ultimately, I'm just bummed that the Project Discovery Tablet will probably never get into consumers' hands again after CES 2014. If AMD put its mind to it with the goal of making lots of dough, the company could easily craft a truly beastly, holistic mobile gaming solution designed around its upcoming Mullins chip. As consolation, I'll take proof of AMD's dedication to both mobile and traditional gaming. We're getting closer to matching PC-level gaming experiences on mobile devices every year, and Mullins looks like it could be a leap in that direction.